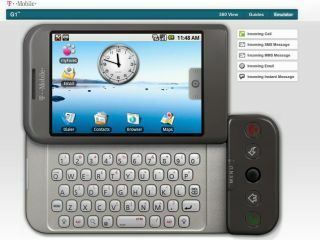 The G1 phone... not really, it's just an emulator! For all of those Android lovers who are yet to try out the new G1 handset, fear not, for an emulator site has been created to let you try out all the lovely open-source-ness. The G1 emulator website provides a complete look around the handset, with the mouse acting as the user's hand, so all the touchscreen functionality is right there. It doesn't, however, give a good feel for the G1 handset, which is probably a good thing, given the main draw of the device is the presence of Android anyway. The obviously missing portions of the device are GPS, browser and camera functions, but you should already know where you are when sitting at a PC, and are obviously able to browse the net anyway. The idea is to help the general public get a feel for the OS before the phone goes on sale later this year, hopefully pushing demand to somewhere near the Apple iPhone (not the 3G version... there were queues for days for that handset).